Welcome to the Town of Fordoche! Our town is defined less by boundaries on a map than by the sense of shared values our residents hold dear. We take pride in maintaining a wholesome lifestyle, rich in cultural history, along with a deep commitment to the preservation of our environment. Nestled in the greenery of the Pointe Coupee countryside, on the winding bayou of the same name, is the picturesque Village of Fordoche, one of the parish's four municipalites, located on the Old Jefferson Davis Highway between Livonia and Melville, 4.5 milles from Livonia and 11 miles from Melville. It has from the outset been an industrious community, well indoctrinated with the "Spirit of `76". Prior to 1912, this was "cotton country", but in 1894, the levee broke at Morganza, with the Fordoche area receiving considerable damage, and adding to that were the ravages of the boll weevil which wrecked havoc during the early years of the century. Records dating as far back as 1894 show that W.O.B. McKneeley was postmaster at that time. Among the names of Fordoche settlers at the turn of the century were Worsham, McKneeley, Saxton, Blanchard, Smith, Bailey, Robertson, Nelson, Noble, Shaw, and Magruder. A moss gin was established as was a mill to make stave bolts which operated until the early 1920's. Most of the original settlers moved away with Italian and French settlers moving in, although a substantial number of Anglo-Saxons names can still be found. The Village was incorporated in 1961, with Anthony P. Pizzolato taking office as Fordoche's first mayor. Arthur J. Hendricks was elected mayor in 1966 and served continuously until 1974, when he decided not to seek re-election. Fordoche's present Mayor is Phillip Dozier, who was serving as an alderman, when he was elected Mayor in 1974. Dean of Fordoche's alderman is John Paternostro, who is currently in his fourth term. Alderman Alfred Roche has served continously since 1966. The other current alderman is Gerald J. Hendricks, brother of former Mayor Hendricks. Victor J. "Vic" Palermo is Fordoche's current Police Chief, while L. Carmello Genusa serves as Fire Chief over the Village's fine Volunteer Fire Department. Mrs. Marguerite Brown is the current Village Clerk, and Mrs. Nelson Bourgeois is the current Fordoche Postmaster, having succeeded her husband, who retired in 1973, following a tenure of 32 years. The latest Parish wide Census, completed in 1975, shows Fordoche with a population of 534, a marked continuance of the Village's steady growth. The attractive Town Hall was completed in 1973, and the temporary Fire Station and equipment warehouse in 1974. The Senior Citizen Center and Fire Station Facility currently under construction in Fordoche are being furnished by the Pointe Coupee Parish Police Jury, and Fordoche has recently received a new Fire Engine which was also furnished by the Jury. There are several churches located within the Village; The Fordoche Baptist Church, St. Catherine Catholic Church which was deticated in 1953, and the Little Union Baptist Church which was built in 1971. The Little Union Baptist Church has a long and inspiring history dating back to 1902. In past years there has almost always been a school in Fordoche. The most recent was the 10th Ward Private School. The economy of the area experienced a tremendous boost, when in December, 1948, discoveries at Lottie and Fordoche, resulted in the birth of the Oil and Gas Production Industries in Pointe Coupee. The first Fordoche oil well was completed on Christmas Day, 1948. Since that time there has been a cumulative total of 39 oil wells, (July, 1975) in the "Bayou Fordoche Field" although no gas wells were found there. In the other field-"The Fordoche Field"- and 18 cumulative gas wells were brought in during that period. The "Bayou Fordoche Field" has through March 1975, produced 6,477,202 barrels of oil, and the "Fordoche Field" 34,291, 867 barrels, 110,372,338 Mcf. of gas. As of July, 1975, there were 37 producing Oil Wells in the Fordoche Field, and 32 producing Gas Wells, as compared to 11 producing Oil Wells in the Bayou Fordoche Field. The Village is almost in the Oil Field, which has provided employment for some of its residents. Others are engaged in industrial and construction work, some specializing in Iron Work, while others follow agricultural pursuits. 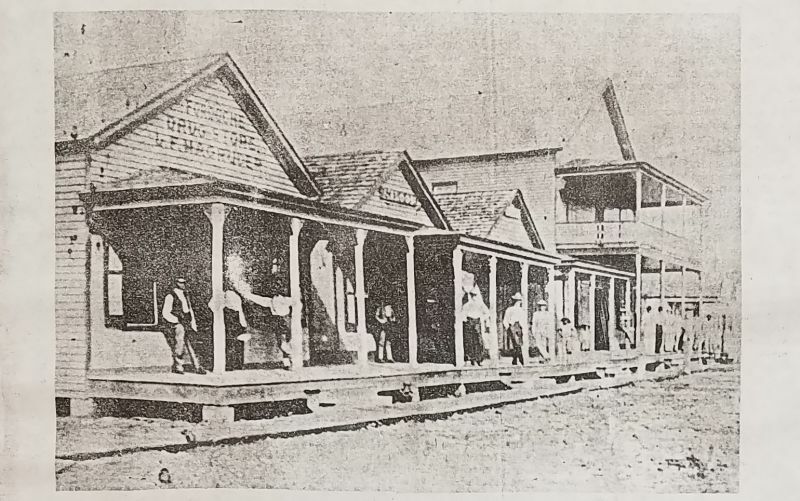 The picturesque community was the scene of significant area battles during the War between the States. The Union Chieftan, General U.S. Grant, had dispatched Major General Francis J. Herron, with a division of 2,500 to Morganza to prevent the Confederates from operating in the Upper Atchafalaya. Temporarily assuming command during the illness of Herron was Major General N.J.T. Dana. An advanced detachment of nearly 1,000 Iowa, Indiana and Missouri Infantry under the command of Colonel J.B. Leake, plus 2 regiments of Illonis cavalry, held a position near Fordoche, with instrucitons to hold the Confederate back. On Monday, September 28, 1863, Confederate General Thomas Green began crossing the Atchafalaya with Waller's and Roundtree's cavalry battalions, and Semmes's battery. Despite a drenching rain, the crossing continued, and by 1:00 A.M. on September 29, all of the Confederates had safely completed the crossing to the East bank of the river. At daylight Green began his forward movement. Waller and Roundtree's cavalry, the artillery, and 3 Texas Mounted Volunteer Regiments moved over the main state road to "Fordoche Bridge" in front of the Union Colonel Leake's position. The cavalry reached "Fordoche Bridge" at 11:00 A.M. and began skirmishing with Union pickets. General Green pushed forward through the deep mud of plowed fields, driving the Federals back. The enemy retreated and disappeared through the turn-rows in a secret lane leading around the Confederate net to Morganza. Two Confederate cavalry battalions rode down the Union artillery, with the Federal Infantry being rounded up as they fled into the muddy fields and brush. The "Battle of Fordoche Bridge" was decisively won by the Confederates. General Green claimed that he lost only 121 men, 26 killed, 85 wounded and 10 missing, as compared to Union losses of more than 500, with 16 killed, 45 wounded and 462 taken prisioner. On May 29, 1864, the "Skirmish on Bayou Fordoche Road" was fought and won by the Confederates. Before sunrise on that day Colonel M.H. Chrysler, while moving his brigade along Bayou Fordoche Road from Morganza came upon the advance of the enemy; driving them back. The enemy force numbered about 300 men but as it retired it increased in number and was estimated at from 3,000 to 7,000 mounted infantry. The confederates were out numbered by 3 to 1. Confederate losses were minor with only 2 men wounded in Colonel Chrysler's command. Incidentally, the second to last surviving Pointe Coupee Confederate Veteran was Charles A. Adams of Fordoche, who died in February, 1935. Adams had served with Company 5 of the Washington Artillery. There has been considerable speculation as to the orgin of the name of "Fordoche" with the most logical deduction being that the name was apparently of Choctow Indian orgin, there also being a bayou in De Soto Parish called "Fordoche". The Creoles seemed to refer to "Les Fordoche" - as remote bayou areas marked by debris, brush, creating water current obstruction. Scenic Bayou Fordoche connects with Bayou Grosse Tete, where once barges were floated. The Mayor and Council of the Village of Fordoche are very grateful for all materials received and would like to take this opportunity to thank everyone who furnished the information and history and photos used in our Bicentennial Tribute to America and Fordoche.